The essential toothbrush to achieve an everyday clean. Removes more plaque than a regular manual toothbrush. 2D Cleaning Action, oscillates and rotates to remove plaque better than a regular manual toothbrush. Content: 1 x toothbrush handle with 2-pin charger,1 toothbrush head. 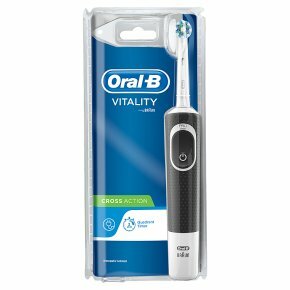 Oral-B, the #1 brand used by dentists worldwide.< Rechargeable Brush with 1 mode and 1 brush head - 2D cleaning // Ships with 2 pin plug> The Oral-B Vitality Cross Action electric rechargeable toothbrush provides a clinically proven superior clean vs. a regular manual toothbrush. The Cross Action toothbrush head surrounds each tooth with bristles angled at 16 degrees, and 2D cleaning action oscillates and rotates for better plaque removal than a regular manual toothbrush. An in-handle timer helps you brush for a dentist-recommended 2 minutes. Best of all it?s brought to you by Oral-B ? the #1 brand used by dentists worldwide. Compatible with the following replacement toothbrush heads: Cross Action, 3D White, Sensi Ultrathin, Sensitive Clean, Precision Clean, Floss Action, Tri Zone, Dual Clean, Power Tip, Ortho Care.